We are offering excellent variety of PU Volleyball. This range of Volleyballs is sturdily constructed that ensures its durability in spite of hard play in comparison to similar other products in the market. We cater only a better quality volleyball in different colours to our customer in best price range with others. We customize the logo as per customer demand. - Imported PU in white/yellow/blue colour combinations with 3 plies of polyester. Being a leading firm in this industry, we are manufacturing a high range of PU Volleyball Ball. We are highly acclaimed in the industry for manufacturing an optimum quality range of PU Volleyball. 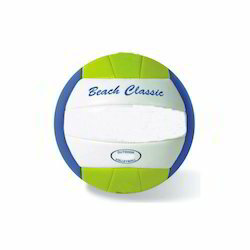 We offer excellent quality Hand Sewn PU Volleyball in attractive colors and vivid patterns. Our Hand Sewn PU Volleyball is properly stitched by skilled workers. Our Hand Sewn PU Volleyball has long life. We offer Hand Swen PU Volleyball at hightly competitive prices. Driven by a vision to achieve significant growth in this industry, we are committed towards providing a wide array of PU Volleyball. Recommendation: Ideal For Matches & Training. We offer wide range of PU Volleyball Stitched. Construction: PU 1.0 mm, laminated with three poly cotton layers fitted with latex bladder, hand Sewn with Polyester thread. We are one of the specialized supplier in PU Volley Ball. These Volley Balls are designed accordingly to offer best construction, finishing, griping, artwork and sampling to our clients. Our products are made from top quality synthetic material and latex bladder to offer maximum springiness. 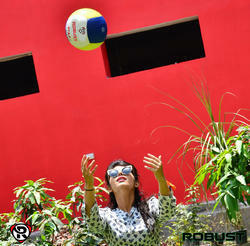 The Volley Balls offered by us are adult hand stitched and coated with two fabric layers.